The agreement will accommodate sharing of knowledge and innovations, agricultural exchanges and joint research internships to respond to the increasing productivity challenges being faced by farmers across the hemisphere. The agreement will accommodate sharing of knowledge and innovations, agricultural exchanges and joint research internships to respond to the increasing productivity challenges being faced by farmers across the hemisphere. The agreement will accommodate sharing of knowledge and innovations, agricultural exchanges and joint research internships to respond to the increasing productivity challenges being faced by farmers across the hemisphere. Members of Fertilizer Canada, as well as other partners such as CDF, AAFC, GAC, Embassy of Paraguay, CFA, Grain Growers of Canada and IPNI, were invited to witness the signing. OTTAWA, ON – Smallholder farmers in the Americas stand to benefit from a technology package designed for a more sustainable and productive agriculture, following the signing of a Memorandum of Understanding (MOU) between Fertilizer Canada and the Inter-American Institute for Cooperation on Agriculture (IICA) today. Degraded soils, drought, extreme environmental events are some of the factors contributing to less than optimal yields, quality and competitiveness of agricultural commodities in many parts of the Americas. Good Agricultural Practices including prudent management of land and water resources continue to hold the key to improved productivity. IICA Representative in Canada, Dr. Audia Barnett observed that “the agreement demonstrates the value of IICA as a bridge for sharing and accessing solutions and opportunities within its member countries”. The 4R Nutrient Stewardship is an internationally-recognized best management practice (BMP) framework with four key pillars for fertilizer application: Right Source @ Right Rate, Right Time, Right Place®. This science-based approach helps growers understand how efficient fertilizer application improves profitability while reducing nutrient losses to the environment. 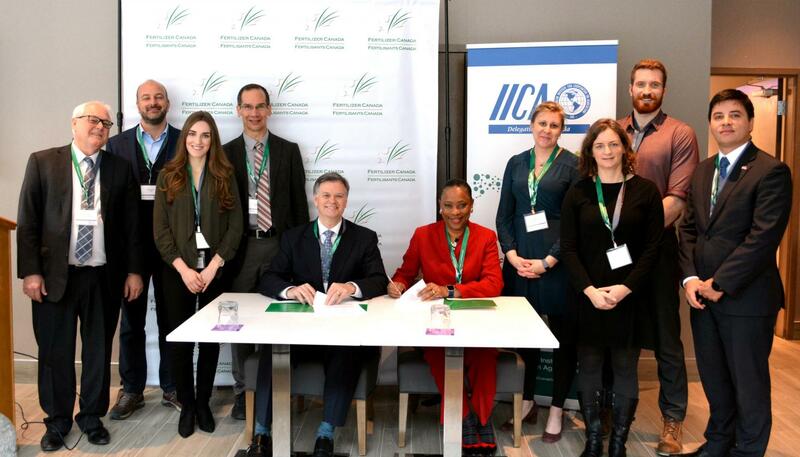 Through joint programming, resource mobilisation and shared learning, Fertilizer Canada and IICA will work with the 4R Nutrient Stewardship for sustainable nutrient management in the Americas towards improved food-security and livelihoods for smallholder farmers. The Inter-American Institute for Cooperation on Agriculture (IICA) is the specialized agency of the Inter-American System for the promotion of agriculture and rural well-being, and our efforts are fully focused on making agriculture competitive and sustainable in the Americas. Fertilizer Canada represents manufacturers, wholesale and retail distributors of nitrogen, phosphate, potash and sulphur fertilizers. The association is committed to supporting the fertilizer industry with innovative research and programming while advocating sustainability, stewardship, safety and security through standards and Codes of Practice. Please visit fertilizercanada.ca.